Rajamangala University of Technology Tawan – Ok, a science and technology university was officially established on 8 th January 2005 by the Act of Rajamangala University 2005. 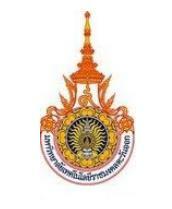 The Act stipulates that Chakrabongse Bhuvanarth Campus, Chanthaburi Campus, Uthenthawai Campus, Bangpra Campus, and Faculty of Agriculture at Bangpra have to be assembled as Rajamangala University of Technology Tawan-Ok and the office of the President is decisively settled in Bangpra Campus. Rajamangala University of Technology Tawan – Ok offers both undergraduate and diploma programs in various fields of vocational education depending on speciality of each campus. Each campus has been progressively developed and has been known for a half of century about expertly providing vocational education. As a result, Rajamangala University of Technology Tawan – Ok is one of fifteen universities providing science and technology education in Thailand that experientially provides varieties of vocational programs.